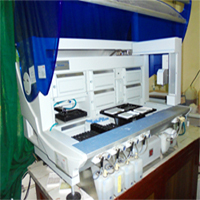 Blood bank provides all patients reliable access to safe blood and blood products -appropriate to their clinical needs-providing the components in time for safe administration. The first step in reducing the risk of transmission of infectious diseases through blood is to select voluntary non-remunerated donors from low-risk populations who give blood on a regular basis as these individuals are at a lower risk of transmitting transfusion-transmissible infections than are family/replacement donors, or paid donors. However, even with the most careful selection, some donors may be seropositive for HIV or other infectious agents. Therefore, rigorous screening of all donated blood is required to ensure the safety of the blood supply.